Wind energy is one of the cleanest, most reliable sources of renewable energy out there, but there’s one strike against it: Most wind turbines aren’t exactly the most attractive sight. But for anyone who says that wind energy can’t match form to function, feast your eyes on the Enessere Hercules wind generator, which was designed by Terry Glenn Phipps. 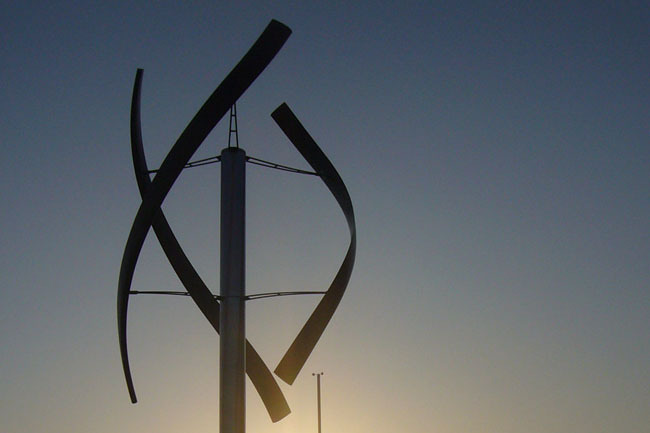 With curved wooden blades, the 23-foot-tall wind turbine looks more like a sculpture than other more utilitarian wind turbines, and because of its clever design, it can harness the power of wind coming from any direction. The Enessere Hercules isn’t meant to contend with those enormous wind turbines you see at wind farms in the Great Plains; instead, it’s presented as a functional wind turbine that could be used at home or maybe even on commercial buildings. The unit has an installed power of 5kW for production peaks close to 3 kW, according to Enessere. The wooden blades used in the Hercules, which were designed by wood engineering expert Renato Guerra, weigh only slightly more than those made from composite materials that are used in most windmills. Because of the sleek design, it’s unlikely that the Enessere Hercules would elicit the same aesthetic critique that many larger windmills have, and we could imagine it fitting in pretty seamlessly in many urban areas. This's simply cool. What a number of great designs are coming up for wind turbines? First, I learned about Energy Ball Wind Turbine and now, Hercules Wind Turbines. I think the future of harnessing energy using wind power is so bright. Wind energy is one of the cleanest, most reliable sources of renewable energy out there, but there's one strike against it: Most wind turbines aren't exactly the most attractive sight. But for anyone who says that wind energy can't match form to function, feast your eyes on the Enessere Hercules wind generator, which was designed by Terry Glenn Phipps. With curved wooden blades, the 23-foot-tall wind turbine looks more like a sculpture than other more utilitarian wind turbines, and because of its clever design, it can harness the power of wind coming from any direction.